When three french heads simultaneously stop their conversations and look at you, you know that something is up. In fact, I’m up – up in the Pyrenees, when I should be getting closer to Bordeaux. How did that happen? And possibly more urgently, am I going to be able to get back to Bordeaux tonight? Today is November 30, The fact that I’m here out of season, combined with some pretty average weather, means that there have been very few tourists around. It’s often felt as though I’ve had Carcassonne to myself today, which has given me a chance to experiment with the timer on my camera. Unfortunately, in this pre-digital age, it’s not until much later that I find the results have firstly captured a cloudy sky as my camera falls back, and secondly the top of my head as I overestimate my height. After a self-narrated tour of the fortifications, I head to the Chateau Comtal where I join a small group of visitors waiting in the light rain for the Chateau to open. The guides surprise us all by walking through the group, opening the main entrance, and then locking the door behind them. As opening time comes and goes, the rain increases, and eventually we’re allowed inside. The delay is never explained, but we’re happy to be in the warmth of the museum inside. The displays of relics found in the area and housed in the museum are impressive. 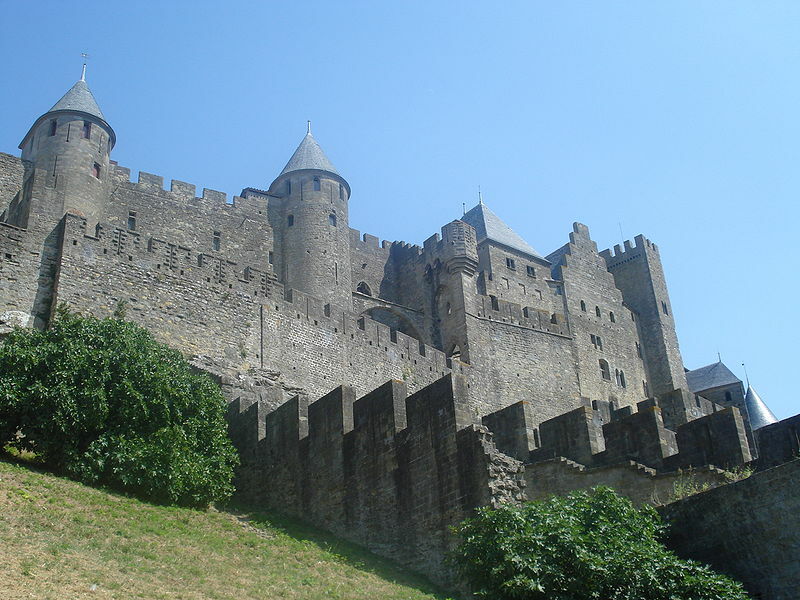 There now seem to be varying reports whether the renovation of Carcassonne is entirely faithful, but it’s still an amazing sight – despite the dreary weather. Once more, thank you wikipedia…(my photos are rubbish). After a now compulsory search for Chocolatines, I’ve taken an afternoon train back to Bordeaux. What I don’t know is that this is a train of two halves – one for Bordeaux, and one for somewhere very unhelpful. I’ve been relaxing by the window, continuously and nonchalantly re-tuning my Walkman as it picks up and loses various regional radio stations. Although I’ve spent the day in a beautiful place, it’s been a dark bleak day, and night seems to have fallen earlier than normal. If it had been daylight, I may have noticed that the signs of the towns we are passing are different from those on the Bordeaux route. If I hadn’t had the Walkman on, I may have heard an announcement. 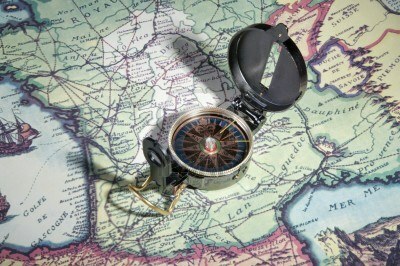 As I get my Eurail ticket clicked, I’m asked where I’m heading. “Bordeaux”, I say casually. Heads turn. Did I say something rude? The locals around me quickly work out what has happened, and my neighbour is voted as their representative in negotiations between me and the ticket collector. Together they quickly work out where and when I need to get off, and which train I need to take to get back to Bordeaux this side of midnight. Apparently, this train split in Toulouse, and my half has headed vaguely in the direction of Spain. That wasn’t the plan. It’s quite frustrating being in a train heading in the opposite direction to the one you want, and there’s nothing you can do about it. You can’t exactly ask to be dropped off at the next bend. I smile at those sitting near me in a “these things happen” way, but they are just staring back at me with eyes that reply “I wonder if he’ll ever get home”. My first chance of exit is Lannemezan. It doesn’t feature in my guidebook. Almost 25 years later, it still doesn’t get much of a mention. But with the benefit of the internet and a lot more daylight, it now looks like a pleasant market town. On a cold night in November 1989, it doesn’t look too promising. While waiting for my train back to Toulouse to arrive, I have time to find a phone booth and let my family know where I am and when I’ll be back. 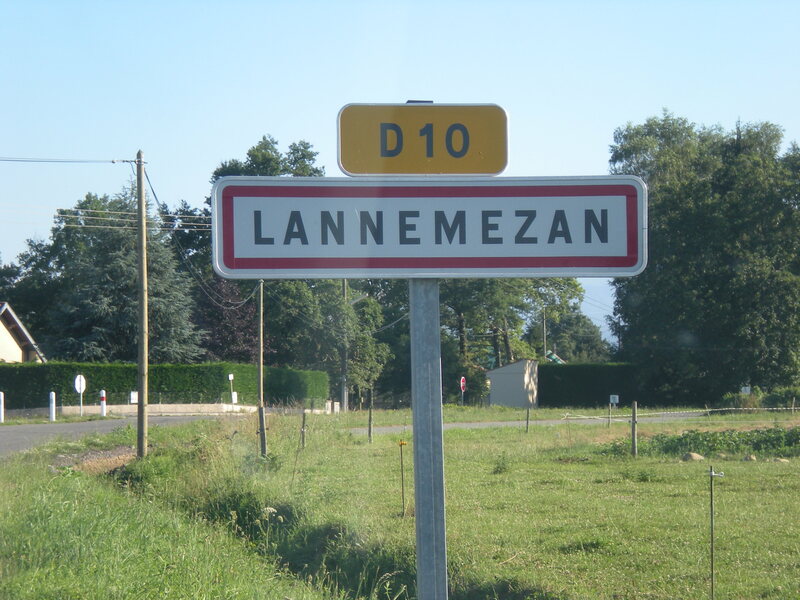 “Lannemezan??? That’s near where we took you skiing two years ago! There’s nothing there but a prison!” I can hear the laughter in Bordeaux as my family learns about my latest path less chosen. It’s starting to rain and there’s a woman waiting to use the phone. As I’m collecting my pile of coins, I accidentally drop some and they clatter onto the muddy and damp base of the phone booth. The woman doesn’t see the funny side, but I can’t let her wait any longer. I scoop up whatever coins I can see without pausing, and head back through the drizzle to the station. 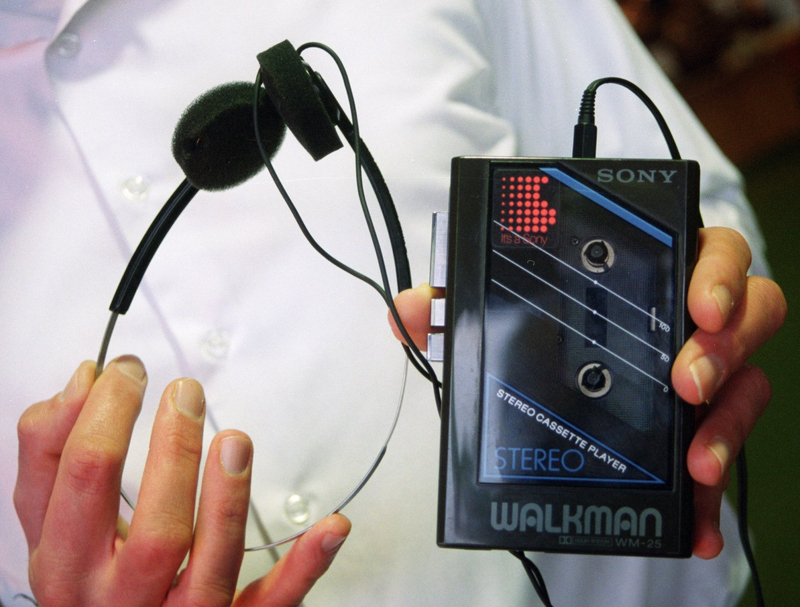 Fortunately nothing else goes wrong – possibly because the walkman is now safely packed away. I take a 7pm train from Lannemezan to Toulouse, which arrives at 8.20pm. A train from Toulouse leaves at 8.57pm, and arrives in one piece in Bordeaux at 11.30pm. I take the 11.45pm bus from the station, and am home hungry, thirsty and tired just after midnight. Sometimes it’s not easy being a tourist. So that was a long day. Maybe parts of the day were initially notable for the wrong reasons, but sometimes it takes a bit of time, distance and an unpredictable train to make memories stronger, and make Lannemezan more than another name in a train schedule. This entry was posted in Travel and tagged Bob Dylan, bordeaux, Carcassonne, eurail, france, Lannemezan, Toulouse, train, travel, walkman. Bookmark the permalink.